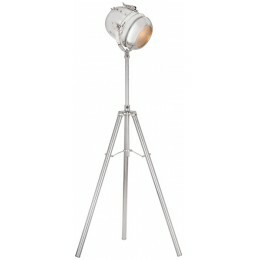 Reminiscent of vintage open-faced Fresnel cinema lights crowding an old Hollywood movie set, our Glitz Collection tripod lamp is perfect to bring authentic interest and a pop of polished nickel sheen to any design space. Equally at home in a traditional, contemporary, or eclectic setting. Perfect for a witty office. Or Imagine it anchoring a cinema-themed bedroom makeover.